I'm African-American and my Mom always prepared black-eyed peas with ham on New Year's Day for good luck and prosperity. My Mom calls me every New Year's Eve to remind me to cook black-eyed peas. She no longer uses ham to season the peas. I always have a bag of dried black-eyed peas in my kitchen cabinet because of this yearly tradition. I was awarded a Bachelor of Science in Justice Studies and a Master of Public Administration from Arizona State University. Go Sun Devils! Then went on to earn a Master of Science in Nutrition Education from Columbia University Teachers College in New York. I also completed my dietetic internship at Columbia University Teachers College. When I was in high school, I had the incredible opportunity to work as a student intern during the summertime at Generals Foods (now called Kraft Heinz Company). I had the chance to work in the Consumer Affairs Department and Food Test Kitchens which was where the registered dietitians worked. I never heard a dietitian before until I had a chance to see and work with them. The Kraft RDs developed and administered surveys about nutrition from consumers and focus groups, wrote articles with nutritional advice for the General Foods Healthy Times Newsletter, and developed recipes for new products in the food test kitchens. I always loved the science behind nutrition and dietetics. Working with General Foods gave me the chance to see what a corporate dietitian does and it also gave me the interest to pursue a career in the field of nutrition and dietetics. I'm self-employed and the owner of The Lifestyle Dietitian LLC, a nutrition private practice based in Atlanta, Georgia. I'll soon be celebrating a year of becoming a nutrition entrepreneur and what I've learned thus far is that each day is somewhat different and that's okay with me. Several days a week you will find me at an inner city non-profit health center working with adults and pediatrics assessing their dietary intake and assisting in improving their health status. The rest of the week I might be conducting healthy grocery store tours, media interviews, or writing blog posts for my website and managing content on my social media platforms. What I've realized is my day may not end at 5 PM or I might work 7 days a week, however, I love the flexibility and freedom to carve my own path in this profession. The biggest challenge in becoming a dietitian was returning to school as a second career dietitian. I quit my full-time job to become a full-time student and dietetic intern. It was difficult navigating the economic pressures of tuition, books, food, and rent with the academic pressures of tests, papers, and projects in my early 30s. However, I knew I wanted to become a registered dietitian and nothing was going to stop me. I continue to trust in God and learned to lean on friends, classmates, and co-workers to get me through. I haven't had someone in my life I would call a mentor but I did have professors, preceptors, and seasoned registered dietitians whom I would ask for advice and much needed support. Diversity in nutrition and dietetics strengthens our profession. As the world continues to grow multiculturally our profession needs to adapt to the beliefs, traditions, and values of individuals from varied backgrounds. 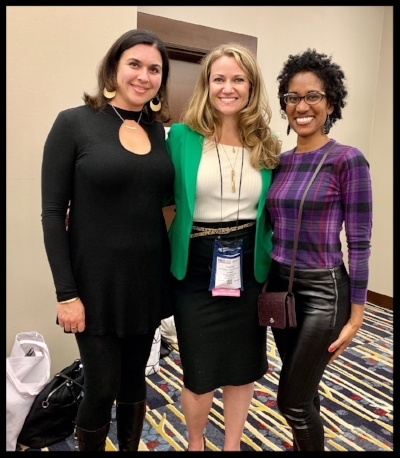 With Tamara of Diversify Dietetics and Wendy and Jess of Food Heaven Made Easy at the FNCE Expo 2018 in D.C.
You bring a unique perspective to the field of dietetics so don't be afraid to share your story with others. Another piece of advice is to say YES to volunteer opportunities to broaden your experiences. Do you have anything you want to share? I love being a registered dietitian nutritionist! This profession has given so many opportunities to utilize many skills from previous non-nutrition related jobs. You are only limited by your own imagination. Jerlyn lives in Atlanta, where she runs her nutrition consulting business, The Lifestyle Dietitian. You can find her on Instagram- always with a smile on her face! Jerlyn is also one of our Diversify Dietetics Mentor, so shout out to her for taking time out of her busy schedule to take care of our DD Community!